The monument is encircled by a 30 foot diameter circle made of concrete. A 15-foot high steel arch represents the entrance to a longhouse and dominates the grouping. A bronze plaque depicting a longhouse, corn, and hemp marks the left side of the arch. A bronze plaque depicting a wampum belt marks the right side of the arch. To either side of the arch is a wedge-shaped piece of concrete with the word Tuscorora engraved on the left side and Nooherooka on the right. Inside the circle, a path of bricks represents the tributary where the fort is situated. On either side, geometric shapes are filled with crushed stone. One shape represents the outline of the Nooherooka fort, while the other depicts the counterclockwise spiral of a traditional dance. An arcs of six concrete tree stumps, representing the six nations of the Iroquois, completes the monument. The spelling of the fort has been rendered as Nooherooka and Neoheroka. Standing opposite the entrance is a reflective stainless mound with both flat and curved faces, and a tree representing the Tuscarora nation. Speakers at the monument dedication included Chiefs Leo Henry, Kenneth Patterson, and Stuart Patterson of theTuscarora Nation. Tobacco seeds, considered sacred and medicinal, were scattered around the monument's perimeter. George Mewborn, whose family had owned the land, awareded Sharon Ginn, the director of the Greene County Museum, with a symbolic deed that grants the Museum stewardship of the monument. Neil Patterson, Sr., three chiefs, clan mothers presented the wampum belt to Provost Marilyn Shearer. The dedication was a three-day event that included scholarly presentations, the presentation of wampum to the university, a lacrosse game, the screening of a documentary video, an exhibition of artifacts, and a communal dinner. This marker commemorates the site of the final major battle of the Tuscarora War at Fort Neoheroka, near Contentnea Creek, in 1713. The fort itself covered one and a half acres and included log and earthen bunkers, a series of interconnected tunnels for transporting provisions, and high palisades. In March 1713, the fort was besieged by a colonial force consisting of an army from the neighboring Province of South Carolina, under the command of Colonel James Moore and Captain Maurice Moore and allied Indians. The siege lasted for more than three weeks. Hundreds of men, women and children were burned to death in a fire that destroyed the fort. Hundreds more were killed outside the fort, while hundreds of others were taken to South Carolina, where they were sold into slavery. As one of the most powerful indigenous peoples in the area, the Tuscaroras had controlled most of the land between the Neuse and Roanoke Rivers. The defeat of the Tuscaroras opened up North Carolina’s interior to further settlement by whites. Other Tuscarora strongholds were abandoned. Some survivors moved north to live among the Iroquois, while others were forced onto a small reservation area in Hyde County. On July 17, 2009, the Fort Neoheroka Site was added to the National Register of Historic Places. The wampum belt presented during the 300th Commemoration is entirely handmade of quahog shells and deer gut. It contains 770 tubular beads in a symmetrical design that includes symbols of homeland and wandering. The gift was especially meaningful because very few of these sacred objects have ever been given. ECU promised to preserve, protect and share the belt with students, faculty, and the public. The spelling of the fort has been rendered as Nooherooka and Neoheroka. Close to two dozen Tuscaroras occupied a field in Snow Hill, NC on October 29, 2006. The farm land, owned by George Mewborn, was the site of Fort Nooherooka. (The family's donation of land made the eventual construction of the monument possible.) The non-violent occupation by the Tuscaroras was intended to establish protection for the site and the repatriation of remains that were excavated from the site over a decade beginning in 1990 by East Carolina University's Institute for Historical and Cultural Research. The archaeological excavation had yielded thousands of artifacts, including human remains. More recently, friction arose over a dispute between the North Carolina Tuscarora and the New York Tuscarora. The southern clans accused the northern clans of overshadowing their existence and presuming to speak for the entire tribe. Activist Timothy Jacobs camped on the public right-of-way alongside the battleground before the commemoration in order to call attention to the fact that some Tuscarora had remained in North Carolina rather than migrate to New York. Only the New York Tuscarora have Federal recognition. Other North Carolina Tuscarora also protested the fact that the New York clans had been specifically invited to take part in the 300th Commemoration, while the North Carolina clans had not. 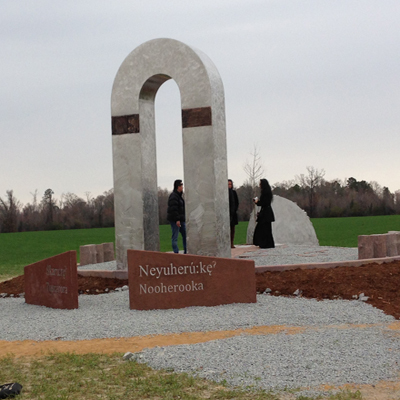 The monument constructed by the Jubrans stands on land donated by the Mewborn family near the intersection of Highway 58 and Nooherooka Road. The monument is approximately .5 miles from the site of the original fort (information provided by Professor Larry E. Tise of the History Department at Eastern Carolina University). The monument stands in a rural area, surrounded by tobacco and soybean fields. Tuscarora language and culture reference their ancestral lands using tree imagery. Two trees were dedicated to the Tuscarora and the fort during the 300th Commemoration at East Carolina University. A bald cypress was planted as the Nooherooka tree, and an existing loblolly pine was dedicated as the Tuscarora tree. After statements by University officials, Tuscarora elders invited attendees to sprinkle tobacco beneath the trees. The sprinkling of tobacco represented both the dedication of the tree and the symbolic dispersion of negative feelings. The trees are located on the campus of East Carolina University. Timothy Jacobs and other activists marked the one year anniversary of the dedication of the site with a small fire, prayers, and the display of the Iroquois Confederacy and warrior flags.